Fly among the treetops and enjoy beautiful views of the Ozark Mountains with one of Branson’s exciting zipline experiences. Whether you’re looking for a fast-paced thrill ride, a half-day themed expedition, or an easy joyride through local landmarks, there's a Branson zipline adventure that’s just right for you. 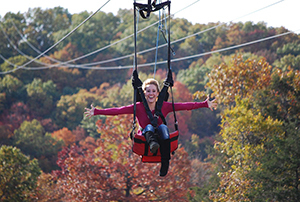 The most popular choice for ziplining in Branson, the Branson Zipline Canopy Tours offer one-of-a-kind eco-adventures which traverse a series of ziplines interconnected via sky bridges, walkways and platforms. The Canopy Adventure Combo has you trekking over running creeks, past majestic bluffs and through the lush canopy of the Ozarks by way of ziplines, suspension bridges and walkways. Prepare for thrill when you ride along Wolfe Creek Preserve's fastest zipline, the Blue Streak Fast Line, standing 25 feet off of the top of Wolfe Mountain. All are adventures not to be missed! Located across from Silver Dollar City, Indian Point features six ziplines zooming 2,700 feet through scenic forest and awe-inspiring views of Table Rock Lake. They offer a Groupon deal, making them one of the best deals for ziplining in the Branson area. If you’re visiting in summer, ride the nearby Hydroslide or grab an ice cream at the Pick A Lick Ice Cream Shoppe. 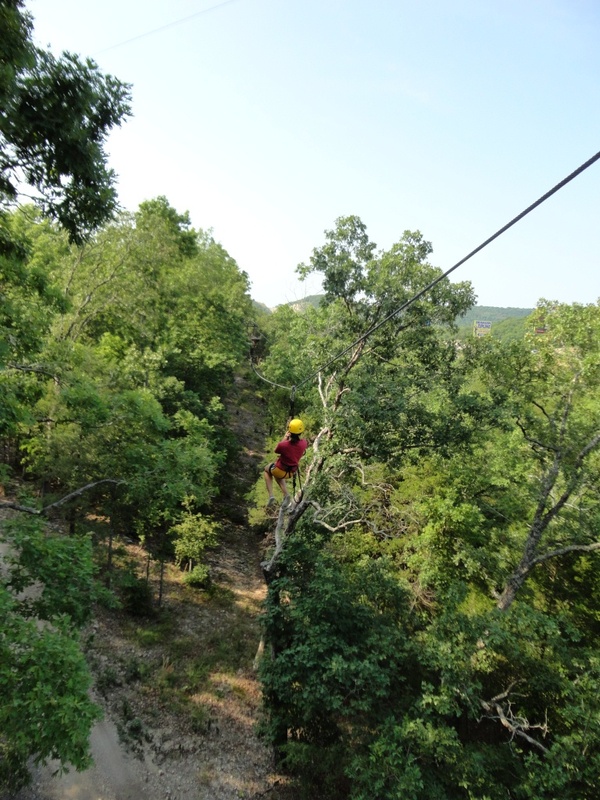 Experience a full-featured zipline complex just minutes from Highway 76, Branson’s Entertainment District. Adventure Zipline features seven different ziplines ranging from 200 feet to 2,000 feet and can accommodate children as young as three years of age. Their two-cable system and their helpful and informative guides will put you at ease, if you’re a novice. By the end, you may even feel confident enough to try zipping upside-down! Most zipline adventures last about two hours. They also offer a “Zip at Night” tour where you can enjoy flying through the night sky. Reservations are not required, but highly recommended. Enjoy the thrills of launching from the 230-foot-tall Inspiration Tower. Vigilante Extreme ZipRider zipline offers jaw-dropping panoramic views of Branson and the Ozark Mountains. From the observation deck, you’ll soar over the 160-acre Shepherd of the Hills at speeds up to 50 mph. Four side-by-side cables allow you to share the experience with your family or friends (note: children must be at least 52 inches tall and weigh 75 pounds or more to ride this zipline). Once at the bottom, a tram brings you back to the tower where photo keepsakes of your ride are available as souvenirs. Soar over Lake Taneycomo with this unique ziplining experience. Unlike traditional ziplines, there is no harness or gear. You only need to sit back in the chair and buckle up. Even better, the zipline at Parakeet Pete’s features side-by-side seats, so you can share the adventure with your nearest and dearest. Sit back and enjoy panoramic views of Lake Taneycomo, Branson Landing, and the entire historic downtown area before an exhilarating, fast-paced return to the landing. Open daily from March 1 to December 31 during any hours Branson Landing is open. And they operate rain or shine, day and night. Ready to give ziplining a try? You can get a firsthand look at the Branson Zipline experience in this fun video! To find more adventures, head to the Outdoor Activities page for more fun ideas in and around Branson and check out Explore Branson's YouTube channel.